Observer design pattern can be easily demonstrated on a chat service where you have a server and several clients (observers). Once a client sends a message, server receives it and RAISES an EVENT (eg NEW_MESSAGE_RECEIVED) which is OBSERVED by all connected clients (observers) and such message is subsequently displayed in message dialog on all clients. In ABAP world it can be demonstrated eg. on an ALV where a change in it’s cell contents raises an event which is observed and further handled in various observers (eg another ALV which automatically updates its contents). 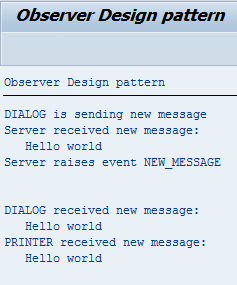 In our example we will have a server (main process) which will trigger an EVENT each time a message is received. All registered clients (in our case it will be a Dialog and Printer clients) will handle the event according to their implementations. Our server (main process) receives a message from clients via public method PUT_MESSAGE and can raise an event called NEW_MESSAGE. put_message IMPORTING i_msg TYPE string. new_message EXPORTING VALUE(msg) TYPE string. WRITE:/ 'Server received new message:'. WRITE:/ 'Server raises event NEW_MESSAGE'. RAISE EVENT new_message EXPORTING msg = i_msg. Because we can have multiple clients handling the data differently, we implemented a common interface that all clients will use, but the behaviour of each client can be different in it’s implementation as I’ll show later with a DIALOG and a PRINTER clients. 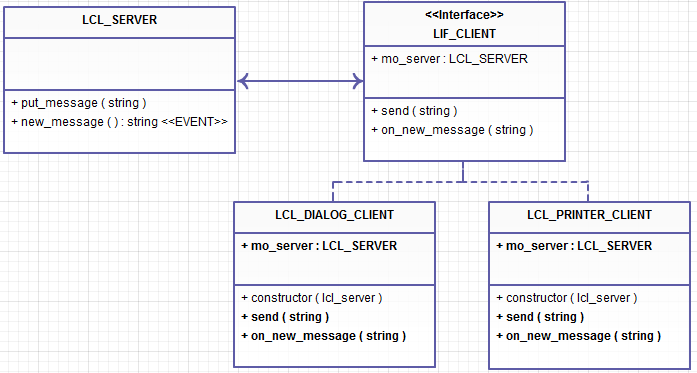 mo_server TYPE REF TO lcl_server READ-ONLY. io_server TYPE REF TO lcl_server. WRITE: / 'DIALOG is sending new message'. WRITE: / 'DIALOG received new message:'. WRITE: / '  ', msg. WRITE: / 'PRINTER is sending new message'. WRITE: / 'PRINTER received new message:'. lo_client_2 TYPE REF TO lif_client. SET HANDLER lo_client_1->on_new_message FOR lo_server. SET HANDLER lo_client_2->on_new_message FOR lo_server. This entry was posted in ABAP, Algorithms, Behavioral patterns, Design Patterns, Development and tagged client, design patterns, interface, observer, OO ABAP, server by Spider. Bookmark the permalink.